This flourless Mexican Chocolate Cake with a Meringue Topping was the winner of a recent dinner party that I didn’t really want to have because I didn’t want the event to happen. It was in honor of a friend and a neighbor who quickly, less than 30 days quickly, packed her entire house and moved to another state, another job, another house, another life. I dream of being a minimalist, but not with people. This is the second person out of my life permanently in the past two months and this is the 15th anniversary of leaving California where I still have memories of crying as I crossed the state line. I didn’t want to leave my friends. My life had so much loss in the early 1990’s, and I just don’t do well with it. My friend stayed with us the night before she left and I envisioned coffee and goodbyes at the door. I got up early, tip toed around waiting for her to wake up. An hour later, I found a note. She had gotten up early and left. She probably couldn’t know that’s not a good way for me to say goodbye. How do you say goodbye to someone? Is it easier to not say goodbye and just leave? How do you deal with people leaving your life? A recent relative through marriage stormed out of our life last month. The end of May was so difficult. The end of June brought a second loss. My head hurt so badly on Saturday, after I got the note, because it was holding back tears of sadness, probably a composite of all of the loss. Everything is changing every minute isn’t it? We’re always fighting off weeds in the garden, decay on the deck, and loss. I am a true optimist. I do believe losses leave empty spaces to be filled, but I can’t dismiss people out of my life that easily. It’s probably why I grieve a little harder and will stay married a little longer. It’s probably why I’m with the same workout team for the past seven years, and still have the laundry basket I bought twenty five years ago at Ikea. I kept all the antique tables I inherited, and painted them white to make them more “me” but I’m holding onto them for life. I can’t let go of what’s important. Those tables connect me to loved ones I’ve lost. I ask again, how do you cope with grief, loss, letting go? Do you walk through it, realizing it’s a part of life or do you deny yourself and cover it up? I’m a little crazy. I turn to God and then I turn to six Big Bang Theory episodes. I wish I was more together, but I’m clearly an emotional mess sometimes. On this rather thought provoking note, let’s talk about this Mexican chocolate cake. I made it because my friend who moved had made it a month ago and we all loved it. I changed the flavors by adding cinnamon and cayenne pepper for an amazing Mexican creamy dense, chocolate cake. 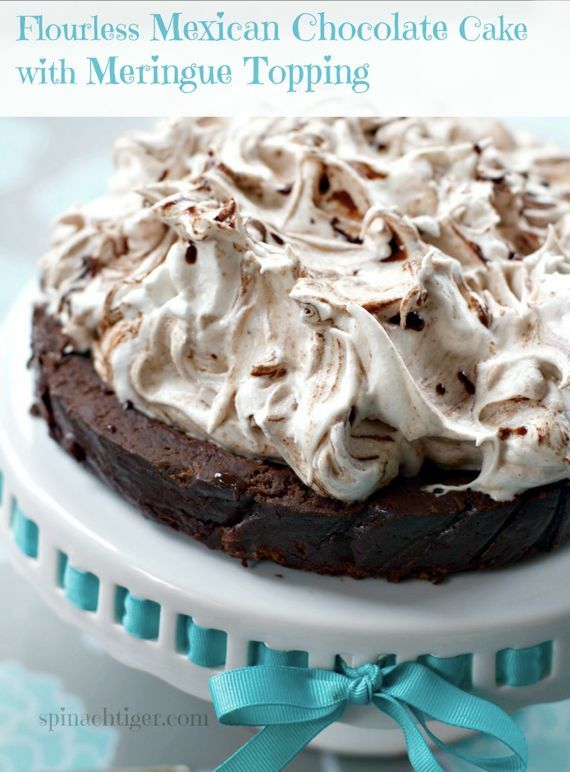 The Meringue is delightful and helps to offset the dark, richness of the chocolate. I used a Porter beer. The beer does something magical to this cake, adds another layer of depth. The cake is delicious, even better than it looks. One person ate two servings and I had to send it home so I wouldn’t do the same. This is the cake I’m taking to the next important pot luck. It’s good enough to show off. It’s a perfect way to say hello or sadly, goodbye. Flourless chocolate cake with cinnamon and cayenne, topped with Meringue. A Mexican Adaption on a Food Network Recipe. Preheat the oven to 325 degrees F. Butter the bottom and sides of a 9-inch springform pan and line the bottom with parchment paper. I used a cake pan with parchment and lifted it out. Put the chocolate in a heatproof bowl and set over a saucepan of simmering water. Stir until the chocolate melts, then remove the bowl from the pan. Mix the sugar with the cinnamon and cayenne pepper. You can start with less of each, and add more at the end as you taste it. See notes. Put the eggs, sugar and salt in the bowl of a stand mixer. Set the bowl over the same pan of simmering water and whisk until the mixture is warm, about 2 minutes. Transfer the bowl to the stand mixer; beat with the whisk attachment on medium speed until tripled in volume, about 5 minutes. Boil beer and vanilla in small saucepan until it reaches a low boil. Reduce the mixer speed to low; beat in the beer mixture, then the melted chocolate, until combined, about 2 minutes. Gradually beat in the softened butter until incorporated. Pour the batter into the prepared pan. Bake until a toothpick comes out with a few crumbs, about 35 minutes. Do not overbake. Cool in the pan on a rack 1 hour, then run a knife around the edge of the pan and remove the ring. Let cool completely. Make the meringue: Put chocolate, butter and corn syrup in a small heatproof bowl, place over simmering pot of water until chocolate melts. Whisk the granulated sugar, egg whites, cream of tartar, salt and ⅓ cup water in a heatproof bowl. Put the stand mixing bowl over a saucepan of simmering water to heat to warm. Return bowl to mixer and mix on low, gradually increase the speed to high and beat until soft peaks form, about 5 minutes. Remove the bowl from the pan; continue beating until the meringue is cool and fluffy. Fold in the vanilla. Spread the meringue on the cake. Swirl in the melted chocolate. Refrigerate. Remove from refrigerator ten minutes before serving. Regarding the amount of cinnamon and cayenne, here is my trick for tasting. Start with smaller amounts of each. Once the cake is batter, microwave a tablespoon of batter. Let it cool a few minutes and give a taste test. It won't be the same texture, but you'll know if you need to add in more cinnamon and cayenne pepper. Adjust to your taste. The cayenne does mellow a bit in the baking process. Use good chocolate. My recommendations are the Belgium 70% chocolate at Trader Joe's or Ghiradelli 60% bittersweet. You can skip the cinnamon and cayenne altogether and this is still a fantastic cake! I could write a lot about loss…a loss so devastating twelve years ago that it will be with me always. I was a person who did not cry much in general. Now, I still cry, sometimes every day. We learn to live with these losses,but they do not disappear and we do not get over them, Prayer and tears. That is all I have, and I think it is okay to allow that and accept the feelings. Perhaps there is a reason people disappear without saying goodbye. As hard as it is on you for them to disappear with only a note maybe it is incredibly painful for them have the personal interaction. We don’t always know what has happened or is happening in someone’s life. It is best not to judge others and to try and not take things personally. Sometimes it has nothing to do with you and everything to do with their emotional state. I always try to approach difficult situations from a place of love and understanding – for all sides involved. Hugs–even several months later lol. The cake looks amazing. Thanks, Laura. Now that I think about it my friend has not suffered major life losses yet. Makes a difference. Looks lovely, I adore Mexican chocolate and then topped with that fantastic meringue, delicious!! Thanks Suzanne. It’s all so good together. This is just the most lovely thing I have seen in a while….no flour, lots of chocolate and that topping is just divine. Oh Teresa, thank you so much. The topping makes the cake! Oh my goodness….this looks divine Angela! Can’t wait to taste it if it’s what you do end up bringing to the NWWB get together! Thanks, Katie, I think I will bring this. Can’t wait. I covet your cake plate!!! The cake looks and sounds wonderful. I don’t believe I have ever had chocolate meringue before. And as to coping with grief and loss, although I’m capable of having a good cry, it has a way of still sneaking up on me at the most unexpected times! I’m sorry for your loss! Thanks, Susan. I love how the chocolate is swirled into the meringue. Thumbs up for this delicious cake. 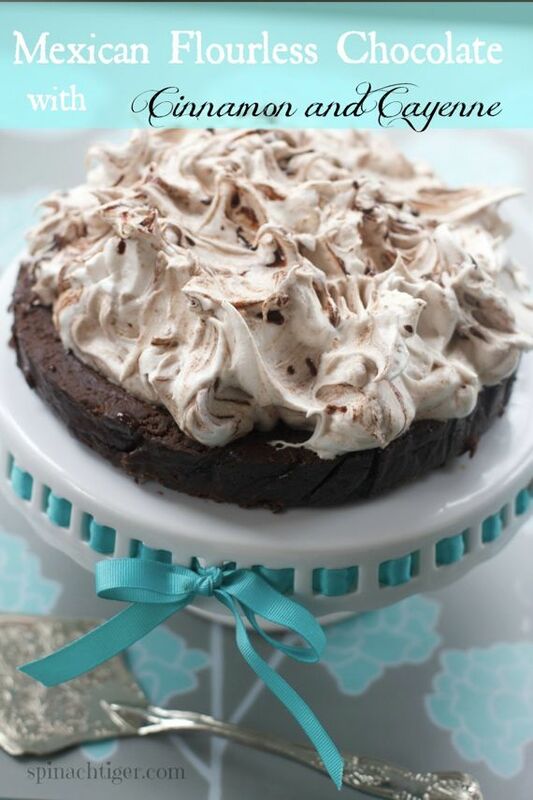 Chocolate is one of my favorite and with meringue topping is work as a icing on the cake. Thanks for sharing it. Watching The Big Bang Theory would work for me, but eating chocolate cake with a meringue topping is a better choice. Yes how about both. I love how they’re always eating on the Big Bang Theory. Cracks me up. I love when you leave a comment. Yep and Yep to all you say. Everybody’s an emotional mess. Some people are just better at hiding it. It’s hard to say goodbye and it’s hard to keep up with all the changes that are constantly coming at us, whether we like them or not. I liked the line about how we’re always dealing with it, from weeds in the garden to decay on the porch. That is so true! A symptom of not being in our eternal home yet. Change always makes me think of this cliche line: Living things grow and growing things change. I don’t know why it comforts me, but it does. God gives us reminders everywhere of this reality and yet when it comes to something I want to hold on to, it’s hard. He is the unchanging one. The only unchanging one! Amazing.